The proverb «Give a piece of iron to a Tula resident and he will make a new samovar from it for you» isn’t known by everyone. A unique piece of work, first brought into the world in 1778 due to the creativity of Russian master Nazar Lisitsin, samovars are known all around the world. Read about Most popular Russian dishes like Borcht, Caviar, Dressed herring, Pelmeni. Sounds, yummy? 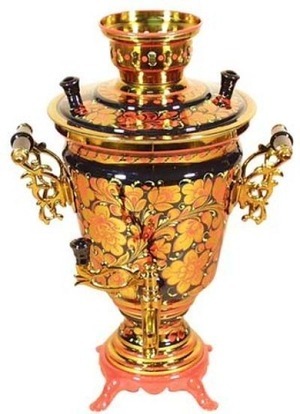 Along with glorious Tula weapons, Tul’skiy samovar is in demand as a unique device for making tea and a great souvenir which can suitably be placed in any house in any country. A Tul’skiy samovar has always stood for high esteem and embodied wellbeing and cosiness of home. In the past, it was an obligatory token of any girl’s marriage. A winter hat with “ear-flaps” and warm back flap, ushanka, can warm anybody in the most severe Russian frost. In the past only peasants wore these hats. In 1940, Red Army substituted helmets for “ushankas”, since then they became popular among civilians, both men and women. Most foreigners buy black or grey military hats made from artificial fur, but Russians prefer “ushankas” from expensive virgin fur: mink, coypu, musquash, and fox. In Soviet times these hats were difficult to find that’s why quality of the government officials’ head-dress depended on their status. Dymkovskiy craft is a unique phenomenon of Russian folk art which appeared in XV–XVI centuries in sloboda Dymkovo on the west coast of the Vyatka River near Hlynov-Vyatka city where at all times stove-setters and potters settled. The history of the Dymkovskaya toy counted 400 years. The traditional processes of creating a Dymkovskaya toy, included modelling from red clay, drying, baking, whitewashing, painting by tempera colors, and decoration with gold leaf, are kept. The first Dymkovskie toys were penny whistles in the form of horses, sheep, goats, and ducks made for the annual holiday “Svistun’i” or “Svistoplyaski”. The distinctive strictness of the toy is its forms and styles of painting. The Russian Matreshka, which appeared at the end of the XIX century, became for many foreigners one of the essential parts of Russian folk culture. 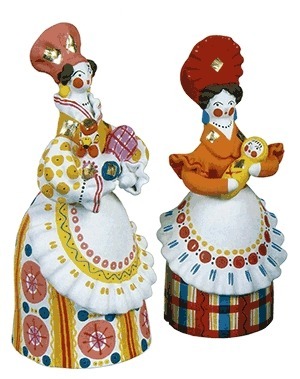 Perhaps, everybody knows what this souvenir represents: three or more the same dolls of different size put one-on-another and painted in Russian folk style: a sarafan, kerchief, flower ornaments, and ruddy cheeks. Generally, a Matreshka is made from a birch or a lime-tree, true Russian breeds of wood. The statuette of buddhistic wise man Fukuruma brought in Abramtsevo at the end of the XIX century from Honshu (Japan) served as a prototype of this doll. At first Matreshkas were “ethnographical” dolls dressed in costumes of inhabitants of different Russian regions. These dolls got Alexander III’s imperial approval. culture Matreshka Russian photo, Most popular Russian souvenirs, popular russian gifts, samovar, Soviet Union souvenirs, top Russian souvenirs. permalink. I,m looking matreshka in samovar-store Gorohovaya street, 69. Go for Souvenirs here when stay in St. Petersburg.